Director of the Atomic Energy Organization of Iran (AEOI) Ali Akbar Salehi said today that Iran has installed 1,000 IR-2m centrifuges at its uranium enrichment facilities, but has not operationalized them. The November 24 Geneva agreement prohibits the introduction of new-generation centrifuges by Iran. 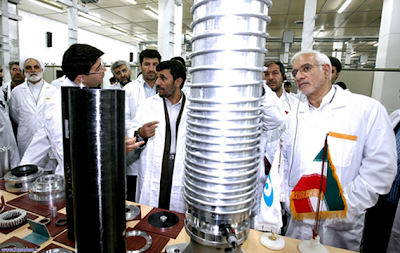 “There is nothing impossible for Iran in producing new-generation centrifuges and we have fully mastered the job,” Salehi added. Enriching to 5% is OK ... above 5% and they will be sorry...! The Iranian haggling mentality is to push things as far as they can in everything. This is why the world doesn't like them and doesn't want to deal with them, and why the option of just bombing this regime, rather than indulging these games, might be the best option of all. It is not clear whether the stoppage is just a temporary goodwill measure on behalf of IRI or a permanent one already agreed in principle. If the later then I am afraid it is indeed a bad … bad … bad deal, one that denies IRI the right to produce nuclear fuel in an efficient and economic manner. Quite honestly, based on simple economic common sense, it would be foolish of IRI to continue with its enrichment programme. Best for who? Certainly not for the ordinary people of the region and America who have to pay and die for politicians' useless wars. Salehi is saying they have "put in" these new type centrifuges but not "operationaiized them." From what I have seen, Salehi has not used the term "install". PressTV is using the term "install," amnd we know the track record for less than satisfactory reporting (something they or their country don't have a monopoly on, where it concerns Iran's nuclear file). "Namely, during the 6 months, Iran will not feed UF6 into the centrifuges installed but not enriching uranium. Not install additional centrifuges. Iran announces that during the first 6 months, it will replace existing centrifuges with centrifuges of the same type." So if you use "put in" and "not operationalize" as Salehi is stating, instead of "install," an argument can be made that Iran is within the scope of the JPA. From Iran's perspective, this is not about turning back their nuclear program. They're quite clear on this. What they're prepared to offer is greater access and supervision, in return for access to higher enriched LEU on the world market and sanction relief. That they will continue to make technological advances with regard to the nuclear fuel cycle should be apparent to even the more casual, objective observer. Infact this situation gives Obama the incentive to back away from the Geneva Agreement. He can always cite the unwillingness of the Iranians to live up to their part of the deal. Islamofacist folks in Iran must not be allowed to even come close to nuclear weapon break-out capacity, because if they do reach that point, god forbid, then the results will for damn sure be catastrophical for the whole region. The GCC countries are feeling threathened by the prospect of a nuclear armed Iran so they would want to obtain nuclear weapons too and the danger for the citizens living in those countries as well as the surrounding ones will increase dramatically. Special report by Fox News. The danger already exists thanks to the covert nuclear weapons programme of the zionfascist folks in israel. Typical zionist and American double standards. all the posturing and talk about new centrifuges doesn't mean a damn thing...... either the regime will bend over and make a deal or it will continue to lead the people of Iran further into isolation, scorn and poverty. Best for the world, and the Iranians, who are sick and tired of dealing with these lying, thieving mafioso. Yeah sure, because America's wars have all been the best things ever to have happened to the world, even since sliced bread! Talk to iraqis who used to live under saddam, or go look in the mirror at yourself and ask why you get to live outside of Iran while other Iranians have to live in that Hell hole. Yeah, because Iraq is paradise now! What should I talk to Iraqis about? How many bombings a day Iraq has? How many shootings a day Iraq has? How many of them have been deformed and poisoned by American depleted uranium weapons? A lot of that is done by Iran and/or or other lying thieving "Islamists" like them. Which is another reason why the U.S. needs to bomb them.